1. 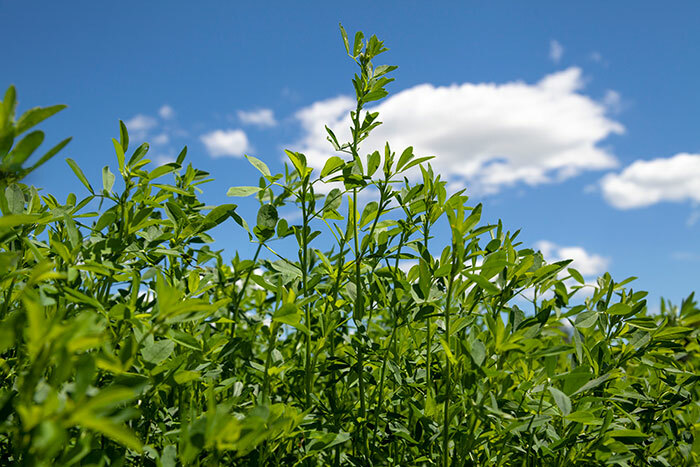 Though genetics and growing environment most certainly impact forage quality, alfalfa forage quality is still largely driven by time of cutting and easily controlled if the weather cooperates. Some producers seemingly make high-quality alfalfa every year; others do the opposite, primarily because of bad timing. 2. Alfalfa yield is less controllable than forage quality; further, it is rarely measured on the farm. This doesn’t mean yield isn’t controllable, just less so than forage quality. Most of what is done with alfalfa along the lines of pest management and soil fertility helps to preserve potential yield rather than raise it. Potential yield is most often governed by genetics, weather, and soil type. 3. Small gains in alfalfa yield are not easily seen but come with great value. Consider this: A mere 1/4 ton (dry matter) per acre yield advantage equates in value to 13 to 17 bushels per acre of corn. Spreading a 1/4 ton of additional yield over multiple cuttings is virtually indiscernible by a grower but amounts to a huge value when factored over multiple acres and years. Alfalfa growers still can’t afford to select varieties that perform at levels of a 1/2 ton or more per acre below elite genetics. 4. High forage quality comes at the expense of yield and stand persistence. Yes, it’s as true today as it was 80 years ago. Transgenic technologies such as reduced-lignin might move the needle on this one, but it won’t eliminate the basic premise. As alfalfa producers, we can never have our cake and eat it, too. 5. Alfalfa value continues to be measured in multiple ways. Hay market price is easy to obtain and is often used. More difficult to measure, but probably a more accurate assessment of value is the impact alfalfa quality has on milk and meat production. Relatively small differences in forage quality can translate into large milk production gains. Conversely, poor forage quality can drastically hinder production and performance. As meat or milk values rise, so does high-quality alfalfa value. 6. A modern hay market grading system is still needed. Marketing hay with total disregard for fiber digestibility is laughable. Fortunately, new forage quality metrics are available for those who choose to use them. 1. Alfalfa has lost acres in what have traditionally been some stronghold regions. Among these are the Upper Midwest and California. In states like Wisconsin, corn silage now comprises one-half to three-quarters of the forage dry matter component of many dairy rations. Dairy farmers often cite higher yields and more consistent forage quality as reasons for a greater emphasis on corn silage. In California, nut trees are replacing alfalfa acres because of their more favorable economic return. Alfalfa feeding in dairy rations has been on a steady decline in the Golden State. 2. Alfalfa production in the South is experiencing somewhat of a resurgence. Though acres in that region will never match the North and West, research and extension efforts have proven effective in getting more alfalfa established on the Southern landscape. Several universities in the region even employ alfalfa breeders who are striving to find varieties adapted specifically to the South. 3. Transgenics have and will continue to bring value to alfalfa. Glyphosate resistance made it easier to control weeds, but HarvXtra remade the plant itself and brought that yield-quality tradeoff gap discussed earlier a bit closer together. To a lesser degree, so have some conventionally-bred varieties. There’s more in the transgenic pipeline as scientists work to identify yield-enhancing genes and look toward finding genes that will regulate the right amount and type of condensed tannins to incorporate into the alfalfa plant. Someday, both traits will provide huge economic benefits to alfalfa producers. 4. Alfalfa is losing public sector infrastructure. Many universities are not filling forage research and extension positions. These are the people needed to not only perform applied research, but also to train future alfalfa and forage experts to work both in the public and private sectors. Alfalfa variety tests have been terminated at most state universities. Federal and state dollars for alfalfa research wanes in comparison to commodity crops like corn, soybeans, and wheat. That’s really nothing new even though alfalfa’s value is third among U.S. crops. Some additional new research dollars for alfalfa have been realized in recent years thanks to the efforts of the National Alfalfa & Forage Alliance (NAFA). 5. Like other agricultural sectors, the alfalfa private sector is consolidating. Plant breeding programs can now be counted on one hand with fingers to spare. There are fewer companies selling alfalfa varieties, and some that do offer very little technical support. That said, other companies continue to do an excellent job of providing quality product and service. 6. Through 2017, alfalfa exports from U.S. ports was a major bright spot for the industry. That optimism has been tempered somewhat in 2018, partly due to higher alfalfa prices. More recently, the retaliatory tariff placed on U.S. alfalfa heading to China has dampened demand from our leading alfalfa trade partner.